Tricky Tracings is a compilation of tracings for more seasoned devotees of electrocardiography. All of these EKG tracings have come from world-wide sources in the spirit of sharing, and in that same spirit, they are shared with you. Most examples will require at least a little thinking, and first impressions are likely to be incorrect. Caregivers of all levels of experience and expertise are invited to participate. Page numbers bracketed in yellow relate to the 6th edition of Rapid Interpretation of EKG's. Students of electrocardiography (which includes the author) may find this exercise challenging, but it is intended to provide practical and useful day-to-day knowledge. Even those who deal with cardiac monitors and electrocardiography daily should find this section interesting. 1) This tracing is from an unconscious elderly male. What is happening here? The heart rate is about 44 per minute. Can you tell us more about the status and prognosis of this comatose patient from his rhythm strip? Although tracings displaying marked bradycardia with wide ventricular complexes are often categorically called "complete (third degree) AV block" [ pages 186-189 ], this may not always be so. We need to inspect such rhythms closely for critically important prognostic information. [ page 117 ], there is no atrial activity (i.e., no P waves or P' waves), because there is a complete failure of the SA node, as well as total failure of all atrial and AV nodal (Junctional) backup pacemakers -- a very ominous prognostic sign. This is "downward displacement of the pacemaker" [ pages 117, 190 ], which is characterized by supraventricular (backup) pacemakers that cannot function due to an overwhelming pathological process -- in this case a massive infarction. With a diagnosis of downward displacement of the pacemaker, signs of further cardiac deterioration are: progressive widening of the ventricular complexes, diminishing amplitude of ventricular complexes, and progressive slowing and irregularity of the ventricular rate. However, contemporary medical professionals don't abandon resuscitation efforts unless clinical death is present or irreversibly immanent. The astute response of Dr. Sidney Soares of Fortaleza, Brazil has earned him an inscribed copy of the new color 6th edition of Rapid Interpretation of EKG's. Thank you Dr. Soares! 2) This section of an EKG tracing of lead I is from a middle-aged gentleman. It was recorded in an emergency room. Is he a candidate for anticoagulation? What are all the diagnostic features of this EKG strip that was printed out from his cardiac monitor? Most responders to this EKG were seduced by the conspicuous jagged baseline [ page 110 ], which is typical of atrial fibrillation (AF). However, and perhaps more importantly, we know that AF produces an irregular ventricular response [ pages 165, 166 ], because only random atrial depolarizations traverse the AV node to depolarize the ventricles. In this tracing, the regular ventricular rhythm indicates a normal pacemaker, which we can identify as the SA node (careful inspection reveals P waves and normal PR intervals). This is a normal sinus rhythm [ page 98 ], ruling out AF, so anticoagulation is not necessary. Skeletal muscular activity or electrical interference from electrical equipment can produce a deceptively jagged baseline. Don't be fooled by an irregular baseline of an EKG; check the regularity of the QRS complexes to be certain. [ pages 301, 302 ]. 3) This is an EKG tracing of a lady in her fifth decade. She has objective symptoms of palpitations. The savvy emergency room physician correctly identified the medication that the patient has been taking chronically. Can you? The doctor decided to do a quick diagnostic (not therapeutic) massage of the patient's left carotid bifurcation. Why? This short tracing reveals a wealth of diagnostic information. How much can you detect? A vagal maneuver retards AV node conduction, delaying the next QRS complex, revealing an uninterrupted series of atrial depolarizations, exposing a (regular) atrial rate of 300 per minute in this patient. 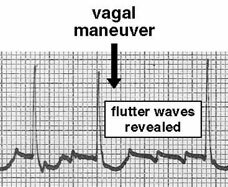 This must be atrial flutter with 2:1 AV conduction [ page 159 ]. Dr. Park also noticed ST depression with characteristics that are typical of "digitalis effect" [ page 317 ]. Indeed, a digitalis preparation was given to the patient in order to depress the AV node enough to produce a higher ratio of AV conduction (e.g., 3:1 or so). The patient eventually responded to the medication, resulting in a more physiological ventricular response rate (not shown here). 4) This is a piece of an EKG from a collection of unusual tracings. No information accompanied the tracing. Can you provide any reasonable explanation of the physiological events that might have produced this EKG strip? Some responders called this Wenckebach (second degree) AV block [ page 180 ]. But notice how the PR intervals are all identical, and the 4th P wave is missing; these findings are not consistent with Wenckebach. Is this the worrisome intermittent Mobitz [ pages 199, 200 ]? No, Mobitz also produces a P wave without a QRS response. Notice that after three cycles, the expected fourth P wave is absent, so there must be a sinus block (SA node block) [ page 174 ], and after the resulting pause, a Junctional focus escapes to fire an escape beat [ page 120 ], producing a normal-looking QRS. We are grateful to Olga Smirnova, MD ("from Russia with love"), who was sent an inscribed book for her diagnostic acumen and EKG savvy. 5) This tracing is from a retired gentleman who was monitored remotely from his hospital room. The floor nurse noticed some "peculiar" activity on the monitor screen, so she immediately printed this strip of EKG tracing. Is this a cardiac emergency? What should be done next? Although there were many persons who, upon seeing this disturbing EKG tracing, wanted to call for a defibrillator, some noticed that it was probably innocuous. In fact, this patient was calmly speaking to friends as the EKG was being recorded. If you take a casual look at the short amplitude deflections near the baseline, you will see that they are much smaller than the tallest deflections that look like QRS complexes (because they are QRS's!). The low amplitude complexes are atrial spikes of atrial fibrillation [ pages 110, 165, 166 ], and the taller deflections are the irregular ventricular responses. The problem is that the sensitivity (sometimes called "gain") control of the cardiac monitor was set so high that the atrial fibrillation caused exaggerated deflections, and the QRS complexes in the monitored lead were relatively short by comparison. Of the correct responders, one was a medical student from California who was very deserving of the inscribed copy of the 6th edition. She preferred to remain anonymous. 6) This is a section of a twelve lead EKG. The tracing strip below is from lead V2. The pattern on the tracing repeats continuously. Can you identify the underlying mechanism(s) causing what you see on the tracing? How serious is it? This bizarre tracing is easy to decipher once we examine the first cycle, which has an extended, depressed ST segment and a peculiar T wave. The T wave of the following cycle is extremely tall because a premature P' has occurred on top of the T wave [ see first Note, page 124 ]. Being so premature, the P' reaches the AV node while it is still refractory and conduction cannot occur. This "non-conducted premature atrial beat" [ page 128 ] does not reach the ventricles, but it does reset the SA node [ pages 125, 126 ], causing a brief pause in pacing. This irregular rhythm is not serious. The series of two cycles followed by a pause repeats, and therefore looks somewhat like intermittent Mobitz [ pages 199, 305 ], which does have serious implications. You should know how to distinguish between these two look-alikes [ page 200 ], since the prognosis is so different for each. This rhythm is so common that all medical personnel will see it soon in a clinical setting... if you look for it. Narinderpal Singh, MD of Chandigarh, India was the first person to interpret this tracing. 7) This is a tracing recorded in lead MCL1, the improvised lead V2 that can be recorded by three electrodes on the patient's chest. Can you explain what caused this unusual tracing? The first two cycles in this EKG strip are normal, even though the T wave is isoelectric. The third cycle by itself is also normal, however, a P' wave from an irritable atrial automaticity focus occurs during (and is superimposed on) the T wave. [ page 128 ]). Also, the SA node is reset [ pages 125, 126 ] by the P' wave, delaying the next paced P wave. The pause elicits a Junctional escape beat from an automaticity focus in the AV node, producing a normal-looking QRS. The sinus rhythm then resumes. [ pages 199, 200 ] . Thanks to Dr. W. M. of London for the correct interpretation. 8) This tracing (unidentified lead) is from an elderly lady who was being transported by an emergency vehicle to a hospital. The EMT happened to notice a rapid rhythm that appeared suddenly. He correctly identified the arrhythmia. Can you explain the rhythm? [ page 150 ], which it is not. Although similar in appearance, the spikey P and T waves do not produce the predictable continuity of timing that one expects with a paced rhythm produced by the same repeating wave. This rhythm is a supraventricular tachycardia [ page 153 ], probably atrial [ page 149 ]. However, the real lesson in this tracing is that in their zeal to identify the rhythm, all the responders overlooked the obvious and MOST IMPORTANT FEATURE. First of all, every ventricular complex is a QS [ page 25 ] in form; this is the same as a Q wave. Now you see the importance! Second, all ST segments are markedly elevated [ pages 266, 267 ]. Very important! Third, all T waves are peaked, hyperacute T waves [ pages 354, 355 ], a marker of acute infarction. This answer is posted without waiting for a correct response. It can serve as a reminder to acute care-givers that arrhythmia identification is important, but not to the extent that a large, acute anterior infarction (this case) is overlooked. 9) This EKG was printed from a monitor with the gain (sensitivity) set too high. Since the overzealous setting of the monitor occurred on the previous shift, the (unaware) nurse viewing the tracing was a little confused by the high amplitude waves. Can you help? This is an EKG taken from a lead in which the QRS is nearly isoelectric, and both the upward and downward deflections are minimal. To make the display easier to see on cardiac monitor, the nurse increased the sensitivity (gain) to the extent that the P waves were so vertically magnified that they looked like PVC's. This patient has a normal sinus rhythm (rate 75 to 100). Once we realize that the largest waves are the P waves, we know that this is a 2:1 AV block [ pages 182, 183 ], most likely Wenckebach. Most important is the ventricular rate, which is in the low 40's. If this patient is hypotensive or if the carotid arteries are a little narrowed by atherosclerosis, a pulse in the low 40's may not be sufficient to sustain consciousness (Stokes-Adams syndrome [ page 189, see last Note ]). Airway! An unconscious patient with a compromised airway can quickly become a dead patient. Thanks to Dr. George C. Griffith (1898-1975), who first explained to the author how bradycardia causes unconsciousness. An inscribed copy of Rapid Interpretation of EKG's was sent to the winner(s) with the best analysis.